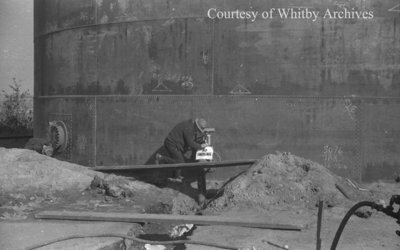 A black and white negative of men working on the Argo Petroleum tanks in the Whitby Harbour on October 19, 1938. In this view one of the men is installing a "NO SMOKING" sign on one of the oil tanks. Argo Petroleum Tanks, October 19, 1938, Marjorie Ruddy. Whitby Archives A2013_040_732B.